In large bowl, beat cream cheese, 1 3/4 cups sugar, 3 tablespoons flour, the orange peel, lemon peel and salt with electric mixer on medium speed about 1 minute or until smooth. Beat in eggs, egg yolks and 1/4 cup of the whipping cream on low speed until well blended. Pour into crust. Reduce oven temperature to 200°F. Bake 1 hour longer. Cheesecake may not appear to be done, but if a small area in the center seems soft, it will become firm as cheesecake cools. (Do not insert a knife to test for doneness because the hole could cause cheesecake to crack.) Turn off oven; leave cheesecake in oven 30 minutes longer. Remove from oven and cool in pan on wire rack away from drafts 30 minutes. Without releasing or removing side of pan, run metal spatula carefully along side of cheesecake to loosen. Refrigerate uncovered about 3 hours or until chilled; cover and continue refrigerating at least 9 hours but no longer than 48 hours. Run metal spatula along side of cheesecake to loosen again. Remove side of pan; leave cheesecake on pan bottom to serve. In chilled small bowl, beat remaining 3/4 cup whipping cream with electric mixer on high speed until stiff. Spread whipped cream over top of cheesecake. Decorate with almonds. Store covered in refrigerator. For 19 grams of fat and 330 calories per serving, omit Crust. Move oven rack to lowest position. Heat oven to 425°F. Lightly grease side only of 9-inch springform pan with shortening. Mix 3/4 cup graham cracker crumbs, 2 tablespoons margarine, melted, and 2 tablespoons sugar; press evenly in bottom of pan. Use reduced-fat cream cheese (Neufchâtel); increase flour to 1/4 cup. Substitute 1 1/4 cups fat-free cholesterol-free egg product for the 5 eggs. Omit 1/4 cup whipping cream. Continue as directed in steps 4 through 6. 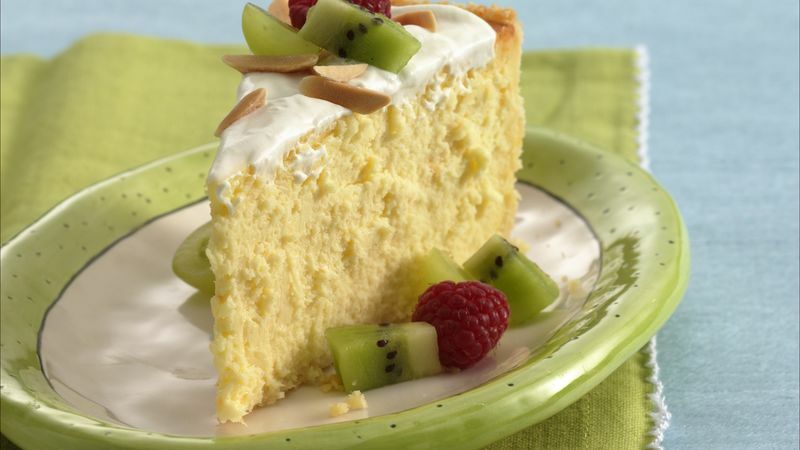 Omit 3/4 cup whipping cream and almonds. Serve with fresh fruit if desired. Fold 1 cup miniature semisweet chocolate chips (3 oz) into cheese mixture before pouring into crust.